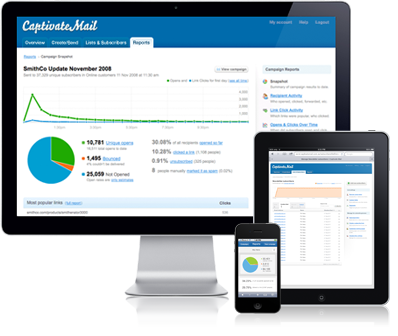 Captivate Mail - Email Marketing Software, Email Marketing Services, and Autoresponders. Create and send captivating email marketing in just a few clicks. Effortlessly manage subscribers and measure your campaigns with great looking reports that go beyond open rates and link clicks. Import your email marketing with a single click. Use our integrated testing tools to make sure they look great in all email programs. We simplify list management by automatically handling the messy stuff like bounces and unsubscribes. Comprehensive real-time reports that allow you to accurately measure the effectiveness of your email marketing. Can't design emails yourself? Simply send us your email marketing design requirements and we will help you out. Our social sharing feature makes it easy to share your email marketing on Twitter and Facebook and then see a report of the results. If you have a Google Analytics account set up for your website, you can also use it to track incoming visitors from the links in your email marketing. See screenshots of exactly how your email marketing will look in more than 20 of the most popular desktop, web and mobile email clients. Simply set the rules around when an auto-responder should be triggered and tell us what emails to send. We'll do the rest. Design two different emails and set how to decide a winner. We'll send both to part of your list then automatically send the winner to everyone. Email authentication, relationships with ISP's, deliverability monitoring, world class data centre, and more ensure your email marketing is delivered.